PC-based computer game State of Decay for Windows will likely grow the necessary protrusions to support keyboards and mice by the end of the week – a month after its alpha release via Steam Early Access. 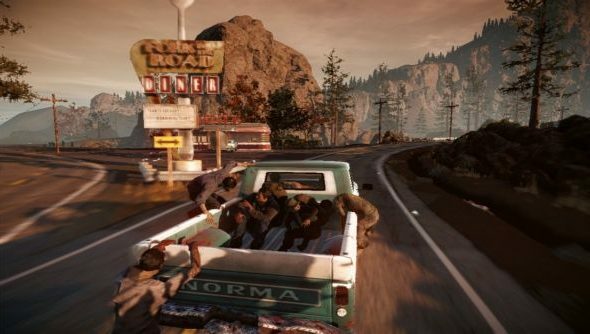 State of Decay is not the zombification of six-part UK press drama State of Playyou were so clearly expecting, but an open-world survival sim that has quietly been eating the entrails responsible for love and affection from Xbox gamers’ torsos since June. It arrived on PC in perhaps too-faithful form, neglecting traditional control scheme support in favour of the 360 controller – still about £25 if you don’t own the attendant console. Despite appearances, however, developers Undead Labs had been developing the PC version in tandem with its Xbox equivalent since the beginning, and have pledged their commitment to the One True Platform. In short: now’s almost the time. Or perhaps you’ve hoarded the requisite supplies to play this already?